Pittsburgh over Colorado: Pittsburgh plays old school and packs the paint. Colorado, not so much. VCU over S.F. Austin: Havoc is hard to prepare for, though Austin can turn other over as well. New Mexico over Stanford: I'm a bit worried about this: New Mexico pounds people inside but I'm worried about how they'll defend and attack on the perimeter. Kansas over Eastern Kentucky: Bill Self is not going to lose another one of these, is he? Florida over Pittsburgh: Florida is too balanced and too good at the little things. VCU over UCLA: Shaka Smart is the better coach, hands up or down. Ohio State over Syracuse: Syracuse is getting Grant back, but the team hasn't looked right in the recent losses. Ohio State has the PG I trust. Kansas over New Mexico: I don't think Kansas can stop Bair and I don't think the Lobos can stop Wiggins. Wiggins is the better player, though. Florida over VCU: Florida point guard Scottie Wilbekin can be a bit turnover prome which would swing this to the Rams. But he also doesn't take dumb shots and Florida's overall talent carries the day. Ohio State over Kansas: The re-integration of Joel Embiid should be seamless, but what if it is not? I remember in a wholly unempirical fashion Duke getting Kyrie Irving back and being unable to sustain their team play. Memphis over George Washington: I've had an affinity for GW since playing with some of their guys a few years ago, but Memphis has better horses. Providence over UNC: the Friars have their issues, but they can score. It doesn't look like UNC are interested in stopping anyone. Connecticut over Saint Joseph's: I struggled with this one. I think this may be a mistake - Shabazz Napier will have to take care of the ball and resist the urge to shoot his team out of the game. The upside is he could shoot his team into the game. Second RoundVirginia over Memphis: like Florida, Virginia can win many different ways. Memphis will be a tough test, however. Michigan State over Harvard: State shot down Michigan's three point bombers in the Big 10 Championship. This is a bad matchup for the Crimson. Iowa State over Providence: I keep thinking I'm overrating the Cyclones but Melvin Ejim and DeAndre Kane may be the best guard tandem in the tourney. Connecticut over Villanova: I'm worried about this upset pick. In most of my brackets I have the Wildcats advancing and I trust Jay Wright reasonably. I really don't know why I picked Connecticut to be honest. Michigan State over Virginia: the Spartans play just as well as the Cavs, but I like the State D and backcourt a tad better. Virginia may find it hard to manufacture points in this one. Oklahoma State over Gonzaga: Mark Few has the better team and is the better coach, but Marcus Smart is the better point guard. North Dakota State over Oklahoma: Taylor Bruan is the Bison's nominal point guard and he'll be the best player in this one. San Diego State over New Mexico State: largely a pick on Steve Fisher. Creighton over University of Louisiana-Lafayette: ULL is probably not the best team in the Sun Belt. Oregon over BYU: BYU are terrible. Arizona over Oklahoma State: OSU has had a rocky year. Arizona PG T.J. McConnell is playing well. North Dakota State over San Diego State: Could Braun be this year's Gordon Hayward? And what's with the Dakotas producing fun-to-watch guards out of nowhere (last year it was SDSU and Nate Wolters)? Creighton over Baylor: Let the 3s rain. Wisconsin over Oregon: Wisconsin is playing beautiful offense which isn't always the case for a Bo Ryan team. Arizona over North Dakota State - I really wanted to pick the Bison to go far, but at some point you have to play defense. I will admit that his is a bit of a hedge pick. Creighton over Wisconsin - I honestly don't have a ton of confidence in this. Creighton's hope is that it turns into a 3-point contest, which it could, and that Doug McDermott has some more magic. Kentucky over Kansas State: Kentucky's youth makes it hard to watch at times and Julius Randle is overrated. But they are the more talented bunch here. I'm a little worried about Andrew Harrison going cold. NC State over St. Louis. The Billikens killed me last year (picked them for the Final Four). They may kill me for picking against them this time. Tennessee over Massachusetts: The Volunteers will eat the Minutemen up inside. Duke over Mercer: Duke won't lose in the first round, right? Texas over Arizona State: Can't believe I'm trusting Rick Barnes but it's amazing his team is even here. Michigan over Wofford: I personally am not a fan of Michigan's one-on-one offense. Wichita State over Kentucky: A huge disparity in experience carries the Shockers. The first of two potentially unfair matchups for the Shockers. Louisville over North Carolina State: it's tough to prepare for the Cardinals defense with such short turnaround. Duke over Tennessee: Duke should have the two best players in this one, right? They can rebound, right? Michigan over Texas: And there goes Barnes. Louisville over Wichita State: the more I think about this, the more I think the Shockers get revenge. A bad pick. Duke over Michigan: Duke plays no defense, but with no Mitch McGary, I don't think Michigan can expose the Devil's utter lack of size. Florida over Ohio State: Overall talent and balance with a coach who's been there. Michigan State over Iowa State: the Cyclones are hot but Sparty plays a special brand of defense. Gary Harris and Keith Appling are solid. As hot as ISU has been, they've also been inconsistent and MSU thrives on their opponent's inconsistency. Arizona over Creighton: The Bluejays can't expose the Wildcat's rebounding woes. 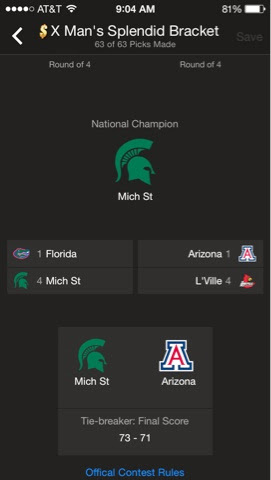 If Arizona doesn't see Wisconsin, I really like their chances at making the Final Four. Louisville over Duke. Another rematch. Louisville will expose Duke PG Quinn Cook as a Roy Williams mole, planted to sabotage Duke at a critical juncture. Michigan State didn't just beat Michigan in the Big 10 title game. They dismantled the Wolverines. Pantsed them. Michigan looked hesitant, unsure of how to score. The few buckets they did sink looked like prayers. That's why the Spartans will win this. The best guards, a strong front court, and a great coach. Kind of like last year's Cardinals.